“It’s a Beautiful Thing…” SKIN the Spa, at the Runnels Center in Flowood, has expanded its medical grade spa to help clients glow from the inside out and invites you to come get the SKIN-ny on products and services during a wine and cheese open house on Tuesday, Aug. 20 from 4 to 7 p.m.
Like Runnels Center on Facebook and share the post for a chance to win the $2500 Grand Prize. SKIN the Spa specializes in laser and aesthetics and offers medical grade skincare products such as Botox, Juvéderm and Latissé, DermAware, Neocutis and Obagi. Reps from these companies will be on hand during the open house to answer questions along with SKIN’s own skin experts – aestheticians Lisa Dyer, Kayla Fisher and Aileen Moran, COE and Dr. Scott Runnels. Attendees have the chance to rack up quite a bit of swag – a $2,500 grand prize “SKIN-tervention” package. Other prizes include a $500 All About the Eyes Package which includes Neocutis Eye Intervention System, Laser Genesis Eye Treatment and Latissé and a $500 Obagi Nu-Derm Transformation Kit. 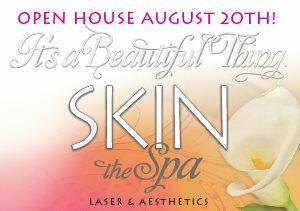 SKIN will offer one-night only discounts including: $10/unit Botox; $100 off Juvéderm; 25% off a package of any six services; and 20% off services scheduled or products purchased at the open house. Keep watch for special Facebook giveaways promoting the Open House by “liking” the Runnels Center Facebook page. Nearly $1,000 worth of products and services are up for grabs!